Kung Fu Ramen: cheesy name, fantastic handmade noodles. We've noticed a few changes in restaurants around Chinatown a while ago and logged them in the mental checklist to visit soon. On the site of the former Vietnamese Xic Lo, Kung Fu Ramen opens offering 'Secret Recipe Hand Pulled Noodles'. Around the corner Lan Zhou Hand Made Noodles is also now Kung Fu Ramen, we're pretty sure it's the same shop. 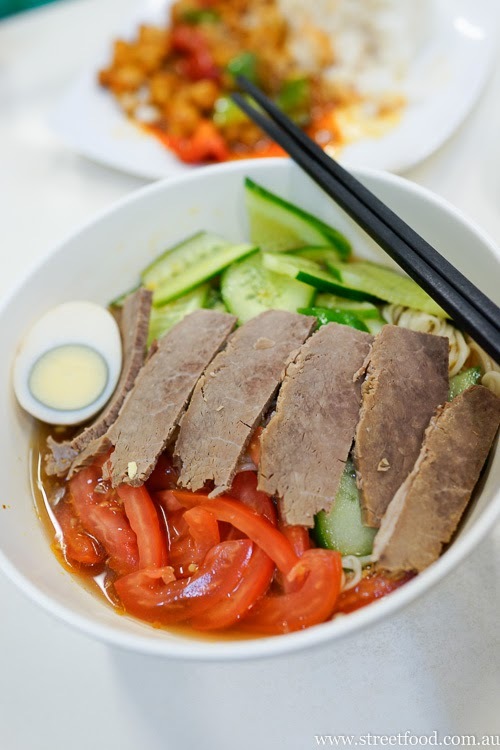 We're thrilled to find Lan Zhou beef noodle soup is still on the menu, look for 'beef noodle soup', about $10. This soup is simple and cleansing and has thin handmade noodles, thinly sliced beef, shallots and half an egg. Google tells me Lan Zhou beef noodle soup is big in China, I can see why. We have to try the speciality, Broad and Flat Noodle Ramen ($13.80). The noodles were like fresh pappardelle, thick chewy rustic pasta, and were delicious coated with the spicy, gravy-esque soup. The noodles were conversation stoppers, heavy and slippery on the chopsticks. There were little quarter discs of cooked radish and some broccoli florets, and two chilis on top just to let you know what you were in for. The beef was thin sliced pieces, somewhat like a corned beef or silverside cut, with a spiced flavouring. As we walk in nearly every table has some of these. Shish Kebabs of lamb with a sprinkling of chili and cumin powder ($10 for 5, or $2 each with an order minimum of three). The lamb is tasty and not too chewy. They are not served piping hot from the grill so we can tuck in straight away but I'm not sure if this is usual. The large metal skewers look medieval, and you can indulge your primal side by ripping the meat off with your teeth. Grrrrrrrrrrr. Shawn orders the Beef Oriental Pie ($10). I think he may have had other thoughts of what it could have been, perhaps a stew, but it turns out to be a fancy-pants Chinese pancake, with beef instead of the usual shallots. Two pieces of fried round bread with a thinly smashed layer of meat and green onions inside, served steaming hot so you need to wait a bit before scoffing. The plainer flavour offsets the spicy chili of the noodles. Cucumber salad - cool and fresh, the perfect stodge antedote..
Fried noodles with lamb - $12. The noodles are excellent, the same as the noodles in the beef noodle soup. Lots of crisp green chives or green onion to break up the sauce. Rice Balls with strawberry topping, an additional $1.20 when you order the ramen (three different choices). The picture on the menu didn't have the little umbrella, I would have ordered it without hesitation if I'd seen it there. These were red bean mochi covered in coconut with a drizzle of strawberry topping and sprinkles. A merry party of flavours. This isn't first date food - we slurped and splattered through the noodles and skewers are never eaten politely, watch out you don't take an eye out. Whatever you do, don't rub your eye after eating the chili soup - we learnt the hard way. It's been a long time between visits and we've forgotten how good this place is, especially the noodle dishes. 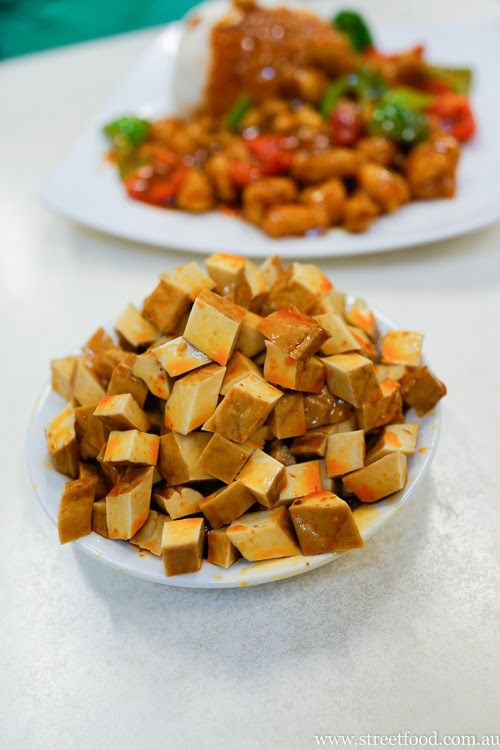 Hard tofu with chili oil, quite a large serve for $4.50. 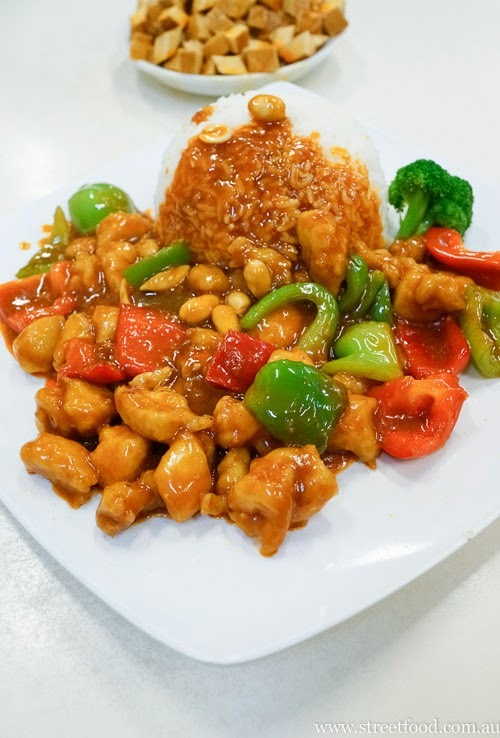 Kung pao chicken with rice (or noodle) - $10.80. Stir fried chicken with peanuts and veggies and a mildly spicy, dark vinegar flavoured sauce. It kind of tasted like sweet and sour without the sweet. Meh, kung pao chicken is always better in theory. Cold noodles with sliced beef and fresh vegetables - $9.90. Fresh, hand pulled noodles served chilled in a light beefy broth. Sensational. Ramen with boiling hot oil sauce - $8.80. The name suggests some kind of medieval torture but it's a modern marvel. 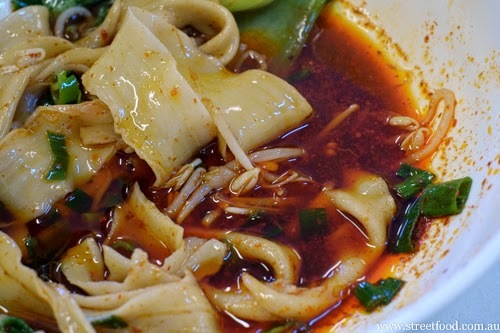 Handmade noodles drizzled in chili oil. It's not super hot, it can certainly be devoured with screaming 'burnies'. The chili powder on top has a bit of a kick but otherwise it's not super chili hot either. Goldilocks would dig it. 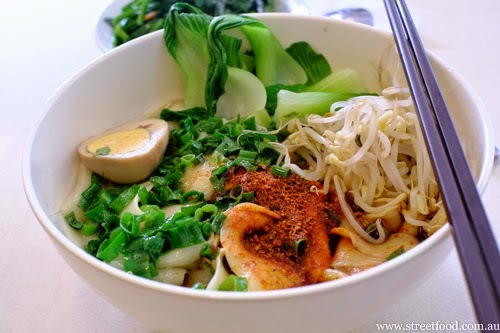 The noodles are sensational, fresh and moist with a satisfying chew to them. And they're flat so they get coated in the umami goodness of the chili oil. An amazing dish. Spinich in ginger sauce - $4.50. 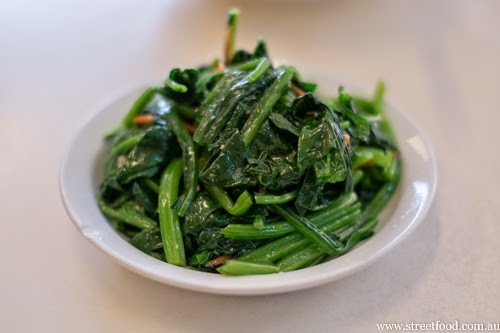 This side dish of fresh, cool greens is a good counter to the stodgey chili noodles above. These are flavoured just enough to sweeten and lift the greens without overpowering them. Highly recommended to all friends of the vegetable. The place at night has a canteen like atmosphere that best suits a daytime dining adventure. Kung Fu Ramen is at 215a Thomas Street, on the corner of Thomas St and Ultimo Rd. See our related post on the previous incarnation of the George Street Branch. Have passed this place a few times without ever seriously going in, but it looks decent for a quick and cheap eat. I vowed never to go there after Xic Lo closed (loved Xic Lo!) but after reading this review I can throw all my morals out the window, those dishes look amazing!!! You're right, those medieval skewers are so much fun! The idea of drowning mochi in strawberry sauce and covering it with sprinkles seems a little odd though, even with a paper umbrella!